For many homeowners, a long-held advantage of buying a home has been the ability to write-off mortgage interest from their taxable income. It’s also possible for reverse mortgage borrowers to take advantage of similar tax strategies, which can result in rather large deductions depending on the circumstances. Taxpayers who own their own homes are able to itemize the interest paid on their mortgage, which they can deduct from their taxable income. This is known as the home mortgage interest deduction. What debt is eligible for deduction? To be eligible to deduct mortgage interest on your tax return, the IRS requires that mortgage debt fits into one of several categories. Home acquisition debt: Mortgages you obtained to buy, build or improve your home, but only if these mortgages totaled a debt of $1 million or less ($500,000 or less if married and filing separately). Home equity debt: Mortgages you obtained other than to buy, build or improve your home, but only if these mortgages totaled a debt of $100,000 or less ($50,000 or less if married and filing separately)—and totaled no more than the fair market value of your home reduced by (1) and (2). It is important to note that these limits are on the amount of debt on which deductible interest is charged, not the amount of interest on that debt. So for example, interest on home equity debt is deductible on up to $100,000 of debt—NOT up to $100,000 of interest. In the case of reverse mortgages, some or all of the interest accrued on the loan may be deductible, but only when the interest is actually paid. 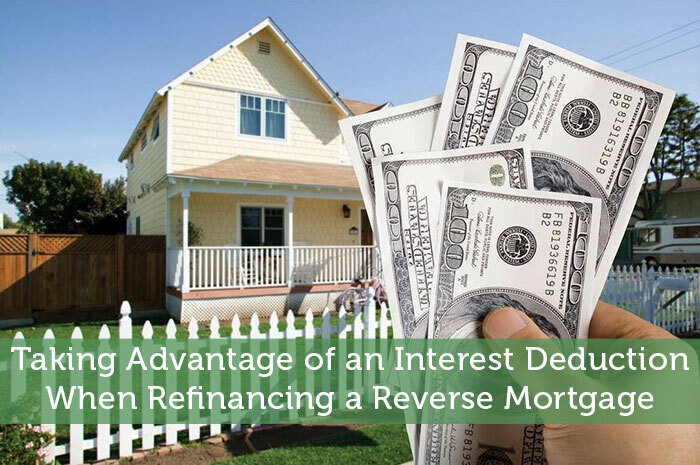 Because reverse mortgage borrowers are not required to make interest payments until the loan becomes due and payable, deducting mortgage interest from a reverse mortgage presents an opportunity for borrowers to leverage these loans in a way that could be beneficial to their particular tax situation. For example, you may choose to not make interest payments on a reverse mortgage for several years, and then make a large payment. By doing so, you could have a large interest deduction and easily exceed your standard deduction, according to Tom Davison, a wealth manager in Columbus, Ohio. “It would be even more beneficial if you were in an unusually high tax bracket,” Davison writes in a paper on Tax Deductions and Reverse Mortgages. An example would be someone in their late 60s who may be bumped up a tax bracket when their required minimum distributions begin at age 70.5. “That could be a good year to make a reverse mortgage payment,” Davison writes. Because the IRS classifies acquisition indebtedness as debt used to buy, build or substantially improve one’s home, refinanced acquisition debt is also considered acquisition debt. Borrowers may choose to refinance the terms of their reverse mortgages for any number of reasons. It could be that their home value has appreciated in the years since they first obtained the reverse mortgage, or maybe interest rates have come down since then and they now want to lock in a lower rate than they previously had. Switching from an adjustable-rate to a fixed-rate (or vice versa), or changing from a monthly payment strategy to a line of credit option may be other reasons why borrowers choose to refinance their reverse mortgages. No matter what the reason for refinancing, borrowers who refinance their reverse mortgage also stand to benefit from bunching interest payments. Bunching is the strategy of collecting tax deductions on items that might be spread over several years onto one year’s tax return. The goal of bunching, Davison writes, is to get a bigger tax benefit by either exceeding the standard deduction and/or taking advantage of an unusually high marginal tax rate. Refinancing could also be particularly useful, he adds, if your home value appreciated well above the size of your reverse mortgage loan balance. In all, the tax implications associated with reverse mortgages are fairly complex and they can become even more complicated when the loan balance is repaid. To better understand how home equity debt may be eligible for the mortgage interest deduction, consult with a tax professional for personalized advice that meets your particular situation. If you are interested in a reverse mortgage and would like to know how this financial tool can enhance your particular situation, speak to your trusted tax professional.